Its reputation precedes it. Its capability excels competitors. Its luxury coddles passengers. It is the 2015 Lexus LX 570, a full-capability three-row prestige luxury utility vehicle for which there seems to be no role it cannot fill. From smooth urban commuting to trekking trails and towing trailers (up to 7,000 pounds), the LX 570, with a powerful V8, full-time 4WD and advanced chassis control systems, answers the call. 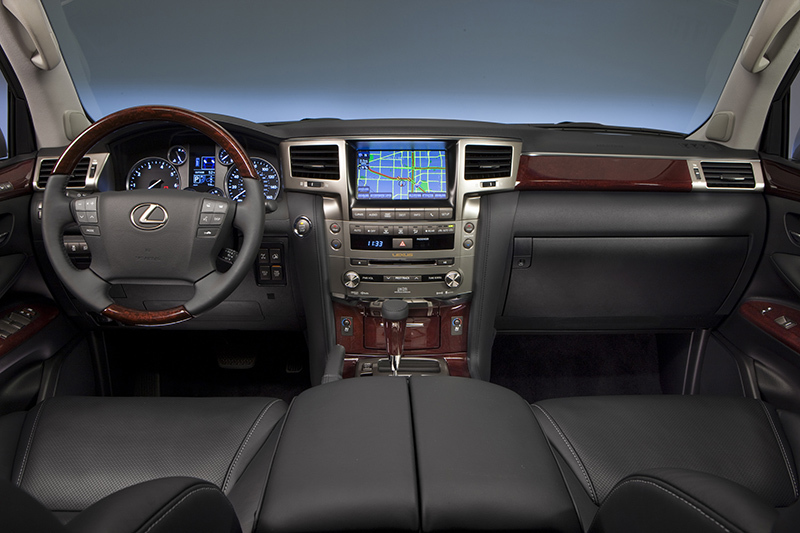 The room, luxury and multimedia technology expected from a Lexus flagship are a given. Lexus has the luxury-utility field well covered, with two crossover-type models, the first-ever NX and the trendsetting RX, and two full-capability SUVs, the GX 460 and LX 570. 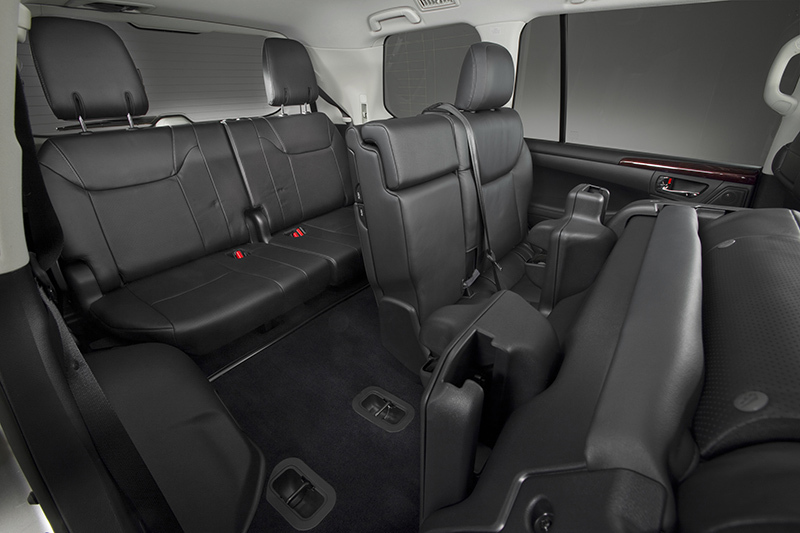 With seating for eight, the LX 570 continues a two-decade run as a benchmark in the luxury utility category. It remains one of the few models that combine sumptuous luxury with true off-road capability. It’s as ready to take the family on a vacation adventure where pavement gives way to rocky trail as it is to take friends out for dinner and theater. For 2015, Lexus raises the LX 570’s multimedia capability by giving it standard Sirii® Eyes Free Mode, which is compatible with the iPhone® 4S and iPhone 5 models forward and puts select Apple’s Siri technology at your service. Siri lets you call contacts, select and play music from iTunes®, get turn-by-turn navigation through Siri and Apple maps, and much more. In addition, the Lexus Enform App Suite has been upgraded to include iHeartRadio™ 4.0 and adds Slacker for even more music-listening choices. 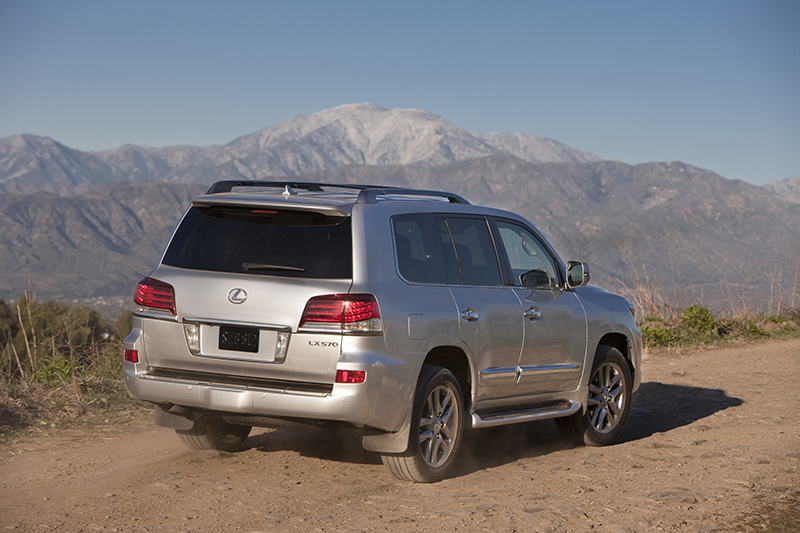 Luxury SUV drivers that want full capability recognize that the Lexus LX 570 has it. It’s an ultra-smooth riding and quiet family vehicle, to be sure, but one that can go places that crossovers cannot. That capability’s foundation is high-strength body-on-frame construction, coupled with high torque at low engine speeds. The 5.7-liter V8 engine produces 383 horsepower and 403 lb.-ft. of torque and is teamed to a six-speed automatic transmission with standard full-time four-wheel drive. Having 90 percent of peak torque available at just 2,200 rpm not only makes the LX 570 an exceptional vehicle for towing, but also makes it a pleasure to pilot in everyday driving. Full-capability requires full-time four-wheel drive, and the LX 570 has it with a Torsen® limited-slip locking center differential that splits torque 40:60 under normal driving conditions. The Torsen differential responds on the move to changing conditions, adjusting the torque distribution as necessary. On-road, 4WD’s traction benefits are seamless, requiring no intervention from the driver. Off-road, the driver can lock the center differential for driving over especially challenging surface conditions. The 4WD gets support from an array of dynamic support features and technologies. The transmission’s driver-selectable low range provides low-speed crawling capability for handling steep off-road hills and uneven terrain. Low-range capability gets support from Crawl Control with Turn Assist and Hill-start Assist Control. On steep hills or while maneuvering over rough, uneven or difficult surfaces, Crawl Control automatically adjusts the throttle and brakes. That eliminates a sometimes nerve-wracking experience for the driver, who can remain focused on steering. The LX 570 does the rest, its Variable Gear Ratio Steering providing optimal steering response in slow, rugged trail driving situations. (On-road, the system enhances directional control). The result is a steady, smooth and even pace. Come to a stop on a hill, and Hill-start Assist Control can prevent the LX 570 from rolling backward when you begin to move forward again. The four-wheel Active Traction Control system (A-TRAC) helps to control wheel slip, and, using the Multi-Terrain Select system, you can match A-TRAC’s performance to the prevailing conditions. Selectable modes include Rock, Rock and Dirt, Mogul, Loose Rock, or Mud and Sand. Trails can be quite narrow, bordered by trees and boulders that might do the LX 570 harm. The Turn Assist feature helps tighten the LX 570’s turning circle by applying brake force to the inside rear wheel. Most drivers will spend most of their time on pavement, where the LX 570 always behaves like a Lexus. The vehicle’s high-strength construction is also a foundation for the silken ride quality, and it’s supported in that role by Adaptive Variable Suspension (AVS). This technology continually adjusts the shock absorber damping rates while driving, ensuring optimal comfort even as the road surface changes. With selectable Comfort, Normal and Sport modes, you can tailor the vehicle’s ride firmness and comfort. 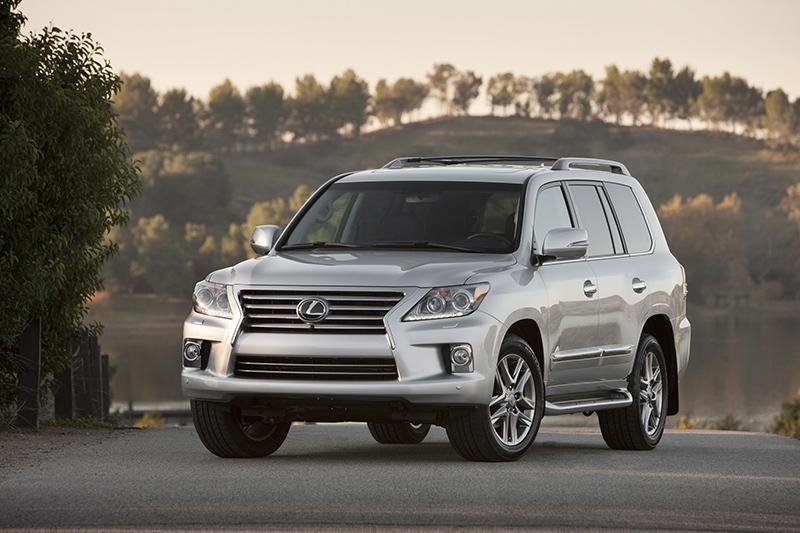 Make no mistake, even with its myriad capabilities, the Lexus LX 570 remains an exceptionally luxurious machine. The 14-way power adjustable driver’s seat includes dual-function lumbar and cushion extender, while the 12-way power front passenger’s seat features lumbar adjustment. Standard cabin amenities include four-zone independent climate control, navigation system, a rear back-up camera, a power-sliding second-row seat and power-retractable third-row seat. A higher-riding vehicle, the LX 570 employs one of its off-road technologies, Active Height Control, to make entry and exit easier. The system lowers the LX 570 by about two inches to assist when entering or exiting. Normal height resumes automatically when the vehicle begins to accelerate. When you switch off the ignition, the Easy Access system automatically retracts the steering wheel and moves the driver’s seat rearward. Both return to their preset memory positions the next time the driver is seated and turns on the ignition. The LX 570 offers room and comfort for eight, but when you need to haul cargo, the versatile cabin layout comes to the fore. The 50/50 split power-retractable third row seat folds to provide 41 cu. ft. of carrying space. Fold the split middle row, and you’ve got 83 cu. ft. of space to fill. The clamshell-design tailgate, which features a power upper section, is more versatile than a one-piece hatch. The LX 570 does an exemplary job of keeping everyone onboard informed, as they wish. The standard navigation system features Voice Command casual-language voice recognition. The system can recognize over 100 voice commands, can map over eight million points of interest and can also display information in English, French and Spanish. Lexus Enform expands the uses of a Bluetooth® smartphone. The LX offers the available Lexus Enform Destination Services, with Destination Assist and eDestination, and provides access to the subscription-free Lexus Enform App Suite. These voice-enabled apps let you search the Internet through Bing™, make restaurant reservations through OpenTable®, get movie tickets via MovieTickets.com™, listen to Internet radio (including Pandora®, iHeartRadio™ and, new for 2105, Slacker), search business reviews on Yelp® and check in on Facebook Places™. Lexus Enform Safety Connect is standard on all Lexus vehicles, while Lexus Enform Destination Services is on all vehicles equipped with Navigation system (standard on LX 570). Lexus Enform Safety Connect and Lexus Enform Destination Services include a one-year complimentary trial subscription. The Lexus Enform response center operates 24 hours a day, every day. Lexus Enform vehicles are factory ready for subscriptions to a variety of useful SiriusXM services including NavTraffic, NavWeather, Sports, Stocks and Fuel Prices. SiriusXM services offer complimentary one-year trial data subscription. The standard nine-speaker Lexus Premium Audio system can play from just about any digital source, including CD, iPod®/USB connectivity, HD Radio™ with iTunes tagging, and streaming music via Bluetooth. The available 19-speaker, 450-watt Mark Levinson® Reference Surround Sound audio system turns the LX 570 into a mobile concert hall. And, for rear seat passengers, an available dual screen rear seat entertainment system allows two sources to be viewed at the same time. A 12-volt power outlet in the middle row seat can power a video game, laptop computer or other device. 5.7-liter V8 produces 383 horsepower at 5,600 rpm and 403 lb.-ft. peak torque at 3,600 rpm. An electronically controlled six-speed automatic transmission estimates road conditions and predicts the driver’s intention in order to select the appropriate gear ratio for the vehicle’s speed and the driving conditions. A sequential shift mode allows the driver to select gears manually. Vehicle Stability Control (VSC) helps maintain directional control during cornering and can be disengaged via the “TRAC off” switch. Hill-start Assist Control (HAC) helps provide additional control for off-road driving by helping to keep the vehicle from rolling back when transitioning from the brake to the gas pedal on a steep incline or slippery surface. Body-on-frame construction provides ruggedness and durability in challenging driving conditions, along with impressive ride isolation characteristics and a 7,000-pound maximum towing capability. The Active Height Control (AHC) system lowers the chassis by about two inches for easy entry and exit and returns automatically to its normal height when the vehicle begins to accelerate. Split five-spoke, 20-inch alloy wheels with Liquid Graphite finish and 285/50R20 tires. The multi-terrain Anti-lock Brake System (ABS) determines road-surface conditions and automatically optimizes lock-up control, selecting the suitable ABS profile for on- and off-road driving surfaces. Electronic Brake-force Distribution (EBD) employs the ABS to properly balance braking forces between the front and rear wheels, while Brake Assist (BA) provides auxiliary force to assist the driver during emergency braking. Crawl Control feature provides optimum throttle and brake modulation when maneuvering over rough, uneven or difficult terrain. Turn Assist helps tighten the vehicle’s turning circle by adding more brake force to the inside rear wheel. 10 standard airbags, including driver- and front-passenger knee airbags, front and second-row seat-mounted side airbags in the outboard seating positions, and roll-sensing side curtain airbags that cover all three rows. First vehicle in its class to use Active Front Headrests that move upward and forward in the event of certain low speed rear-end collisions when the force of the occupant’s body is applied to the seat back. First in its class to offer available Pre-Collision System with Dynamic Radar Cruise Control. First Lexus to offer the optional Wide-view Front and Side Monitor. Designed for use in tight settings, such as parking garages, cameras can display the front and side views simultaneously in split-screen mode. 12-volt power outlet in the middle row. The 40/20/40 split, power-sliding second-row seat slides forward and aft 3.5 inches for passenger comfort and cargo storage versatility. Power retractable third row provides easy access to the cargo area. The split rear tailgate features a power upper door, while the bottom section raises and lowers with minimal effort. Luxury Package includes a cool box for beverages; semi-aniline leather-trimmed seats with contrast stitching; heated steering wheel and mahogany wood trimmed door switch plates and rear armrest; heated and ventilated front seats, and heated second-row seats (outboard positions). Dual screen rear-seat entertainment system with wireless headphones and three-prong electrical outlet. Cutting-edge multimedia abounds in the Lexus LX 570, providing something for everyone onboard. 48-month/50,000-mile basic limited warranty with roadside assistance for 48 months/unlimited miles. 72 months/70,000 miles powertrain and restraint system coverage. 72 months corrosion perforation protection coverage, regardless of mileage. YOUR HOME FOR AUTO NEWS AND AUTO INDUSTRY UPDATES.